Whether you are hosting a large group for the holidays, or a small intimate gathering, San Simeon has the perfect pairing for any meal. The Riboli Family’s San Simeon collection boasts a variety of food-friendly, thoughtfully crafted wines that pair tremendously with an assortment of different holiday classics. San Simeon 2014 Viognier is a bright, luscious wine with ripe peach flavors and hints of tropical fruit. Slight mineral notes express the rocky terrain of the El Pomar AVA in Paso Robles, where these grapes are grown. The aromatic components of San Simeon Viognier, along with the delicate structure and lengthy, smooth finish make this a perfect pairing for a medium-bodied dish, such as crab or lobster with cream or butter. San Simeon 2014 Chardonnay is a rich, mouth-filled wine with ripe tropical fruit flavors and complements of citrus and pear. This structured and well-balanced wine shows a lengthy finish that works subtly alongside salmon fillets with a lemon butter sauce, and it will easily complement all other side dishes on the table. 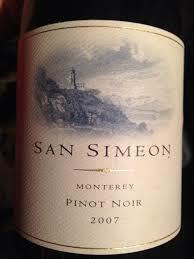 Pinot Noir is well known as the perfect pairing for turkey, and the San Simeon 2014 Pinot Noir is no exception. This rich, fruit-driven wine with ripe flavors of black cherry and raspberry is soft and round with a lingering finish. The bright acidity and aromas of red fruit allow San Simeon Pinot Noir to elegantly complement the flavors in turkey, without overpowering them altogether. For dinner tables that typically feature heartier options, such as prime rib, San Simeon 2012 Cabernet Sauvignon is the perfect candidate. Ripe flavors of spicy plum and currant are complemented by nuances of cocoa and spice, which pairs well with the tender, flavorful characteristics found in Prime Rib. Structured tannins provide texture and a lengthy finish, allowing San Simeon Cabernet Sauvignon to stand up to a hearty red meat. Rounding out the menu is San Simeon 2013 Stormwatch, a blend comprised of 47% Cabernet Sauvignon, 21% Merlot, 16% Malbec, 11% Petit Verdot, and 5% Cabernet Franc. This Bordeaux blend was handcrafted in small lots and was aged primarily in French oak barrels, giving it spicy notes and ripe raspberry and blackberry flavors. The dark, rich, and intense flavors of San Simeon Stormwatch make it the perfect pairing for a leg of lamb roasted with rosemary and garlic. The Riboli family began its legacy of winemaking in 1917, when San Antonio Winery was established in downtown Los Angeles. Since its inauguration, Riboli Family Wine Estates’ portfolio has grown to include multiple different brands. As founding winery of Riboli Family Wine Estates, San Antonio Winery continues a proud heritage of winemaking in Los Angeles and Paso Robles that spans four generations of the Riboli family. The family’s commitment to producing award-winning wines has included investing in vineyards in California’s most prestigious regions, including the Rutherford AVA of Napa Valley, Santa Lucia Highlands and Arroyo Seco AVAs of Monterey County and the El Pomar District and Creston AVAs of Paso Robles. Most recently the Riboli family has been committed to growing its presence in the award-winning Paso Robles wine region, opening a state-of-the-art winery in 2016. Follow Riboli Family Wine Estates on Facebook, Twitter, and Instagram, or visit SanAntonioWinery.com. The award-winning wines in the Riboli Family Wine Estates portfolio can be enjoyed at their three tasting rooms located at: 2610 Buena Vista Drive in Paso Robles, CA; 737 Lamar Street in Los Angeles, CA; 2802 S. Milliken Avenue in Ontario, CA.